A post-modern comedy series that spoofs the world of upper-class food. A gleeful satire which takes potshots at celebrity chefs as well as the snobbish upper-class, the only flaw Posh Nosh has is its unfortunately short running time. 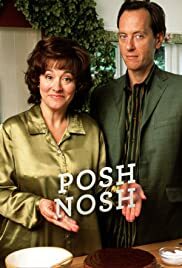 Richard E Grant is once again the sneering, superior toff, a role he does exceptionally well, while Arabella Weir's Minty tries to maintain the same nose-in-the-air attitude, ('Lard makes me think of fat people in the co-op - perhaps you're one of them'), but occasionally lets her middle-class roots show. Highlights include David Tennant's cameos as the object of Simon's not-so-discreet affection, as well as Simon's drunken tirade on the disregard of sauces.